Like every other form of outreach, email outreach has a low success rate and generally followed up by another form of outreach. This simply involves sending an email directly to your target. Most businesses have an email address or contact form on their website, so this is also the easiest method. Since it doesn’t cost any money and their is no barrier to do it, it’s often overused and misused. Businesses have gotten used to receiving email outreach from offshore companies and this attempt is very difficult to pull off unless you have a unique approach and an awesome title and opening sentence. This method involves a bit more skill and budget. You need to have a calling plan, which most marketers get through Skype for an affordable rate. For optimal performance, you also need to have an accent matching the country of the business you are reaching out to. So if you’re calling US companies, you generally have to hire someone from the US or Canada, or someone with an American accent which can be costly compared to email outreach. Direct mail is the process of sending physical mail to your target. Currently, it costs $0.49 USD in the US and $0.85 CAD in Canada to send an envelope. If you decide to send a larger package, which will get more attention from the receiver, the price is only going to rise. Direct mail can receive the highest response rate but since it costs the most, it can be hard to make profitable. This is one of the hardest to perform, but it can lead in a lot of interested buyers and inquiries. B2B search terms on Google generally have a very low monthly search count because the market by customer count is lower, but since the value per buyer is so high, it’s often overlooked by new B2B companies. These terms do have very large competition in most cases, and most established companies can afford to stay at the top and hold any newcomers out. This is probably the most difficult method to pull off, because there’s not much info on it. By appearing in industry magazines, blogs and other publications, you can easily get in front of who you need to. For example, if you have a software that helps car dealers manage their inventory you might appear in a magazine geared towards car salesman and car dealerships. An article you might appear in would be something like “Top 5 inventory management software in 2016,” for example. Recently I’ve been hiring a lot of graphic designers. Normally, I hire Fiverr when I’m bootstrapping to create a minimum viable product but this time I had a bigger budget and was not really sure where to look. After asking around, a number of people held firm and continued to recommend Fiverr. I told them if I can’t find a good logo designer soon, I will probably drop $100 on Fiverr and see if I like another of the 20 $5 logo concepts. However, this logo was needed for a large company with a reputation, and I wanted to get it professionally done to ensure I had rights to all the graphics used, as you never know on Fiverr if the seller illegally copied someone else’s work and when he’s based in India or another foreign country, he quite frankly doesn’t care. I needed a logo that could be shown on a 10′ by 10′ sign, embroidered on thousands of hats and jackets, and hung on many sponsor banners. After contacting a few freelancer designers that were recommended, they all had an excuse as to why they would not take on another logo order. I also knew 99Designs.com from back when I was just getting into the industry and was also recommended to find people on Dribbble. Let me explain my thoughts on Fiverr, 99Designs and Dribbble and why and when you should use each of them. For budgets under $300, I’d recommend Fiverr. Fiverr is a marketplace where freelancers offer services for $5 each. I’ve used Fiverr to design almost a dozen logos, and a few apps. I generally only work with the most rated sellers. For logos, at least 100 ratings and 4.9 stars or higher. Sometimes, I’m in a hurry, and I’ll choose 24 hour turn around times, but those logos are never that great. Also, if they say “unlimited revisions” that doesn’t mean the logo will be good. It just means that they are aware that they lack that much creativity that the logo will probably be bad and you’ll have to walk them through how to make it better. You will need to include samples to reference and the colours you want. Always check the samples that they provided and their last 10 most recent reviews. Look for reviews that discuss repeat orders. Logos that take about 3 days are generally higher quality than otherwise. Although every project might not be a score, if you order a couple logos and follow my advice, generally one should fit your needs. If your budget is in the $300-$1000 range, this is where you should be looking. 99Designers is a contest platform where designers compete to build you the best graphic. I’ve only done 1 contest on 99Designs and it was a fantastic success. It was for an established business, so the contest looked like a good opportunity to designers. Whereas a startup looks like a risky contest since you never know if the startup will change their mind and cancel the contest. If you guarantee a reward, you’ll remove that freight that the designer has and have a much higher chance at receiving many designs. You’ll also want to include samples of logos that you like. There are a number of pricing options. I chose the $299 plan, and it brought 200 concepts, more than most receive. You should comment and rate every design you receive to show the designers that you are a good, responsive, rational employer. You can contact support to extend your deadline, which will bring more submissions. Once you get 100+ submissions, you’ll be ready to move to the next phase of choosing the finalists. You should choose 6 designers. If you have trouble choosing, they also have a poll system where you can create a poll, and then share the link with your customers. I shared mine on Facebook and received 29 votes and comments. Upon completion, you’ll receive the the final work and the designer will sign the Design Transfer Agreement. Lastly, our most expensive option, Dribbble is for those with a budget over $1000 for their logo. Dribbble is a social network for designers to show off their work and receive opinions from other designers. On here, you’ll find some of the top designers around the world such as Mackey Saturday, who designed the Instagram logo. To access these designers, you’ll have to pay a fee of $20 to search and email an unlimited amount of designers for the next 12 months. Being as naive as I am, I contacted a number of designers. Most of them took a few days to respond and the lowest quote I received was about $750. Another said $1150 per 2 Concepts with 2 Revisions on the concept of choice, then another $100 for an additional concept. Another for $3000-$5000, while another said his typical project is $6,500 for 5-7 concepts and two rounds of revisions. Mackey Saturday humbly declined and a number of others quoted in the $4000 range. Dribbble definitely puts you in contact with the best in the business and you can see how qualified they all are by looking at their work and what other talented designers have thought of it. If your budget is over $1000 and want a high end designer, this is the way to go. Out of these 3 options, we’ve looked at a marketplace, a contest platform and a social network as a method of sourcing logos. They each conveniently divide themselves up into budget categories for us to choose from. Recently, I did a study of how important domain extensions like .com, or more specifically, how common they appear in Google search engine results. These numbers are derived from tens of thousands of tests, which is a sample size large enough to consider this data fairly accurate.The data was gathered from a server IP based in France. However, this didn’t have much of an effect on the results as only 0.5% of the first-page results came from .fr domains. I found that out of tens of thousands of results, 79.9% of the first page results were from .com domains. As for the .net extension, 1.17% came from .net domains. The .org extension held much of the remaining share left behind from the .com domains with a 9.6% market share in the SERPs. Now the .info domain is where a big answer is shown. Only 0.07757% of the results were .info domains. This really explains how useless .info domains are when it comes to SEO. When I looked at just top 3 results, 78.497% of the domains were .com. This data was gathered by Josh MacDonald via Python scripting on December 20, 2014. Anyone who wishes to use this data, please pay respect and give credits to this page. 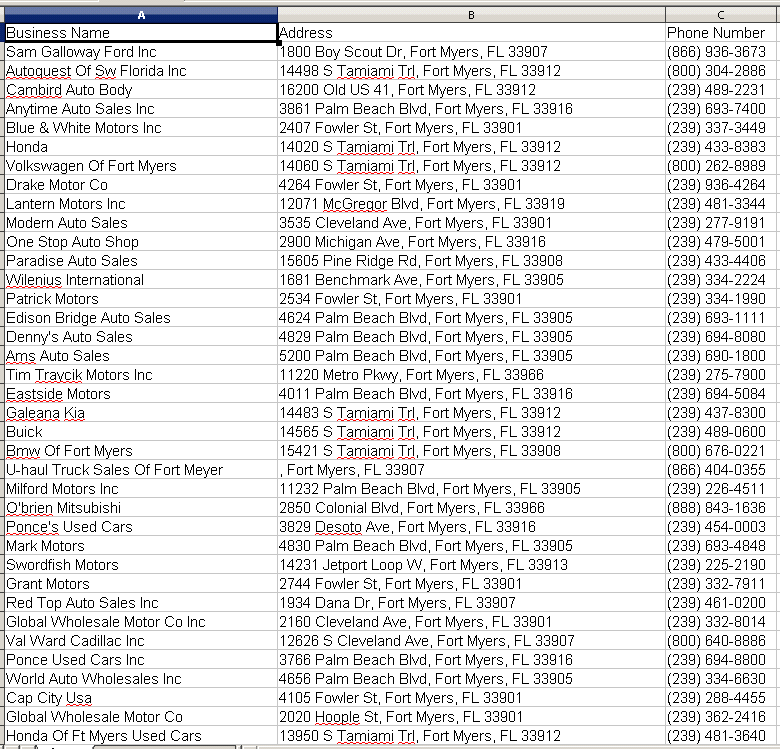 Search and save thousands of businesses as a CSV spreadsheet file. Download our free software today, and run it on any Windows computer. Find thousands of great domains names available for just a few dollars on GoDaddy Auctions. Out of the 150,000 domain names up for auction in GoDaddy’s Closeout section alone, don’t you wonder if you’re missing out on some hidden gems? With this tool, you’ll be able to scrape those domains, and use your Moz API (available free) to build a large spreadsheet containing each domain’s page and domain authority. Domain authority is a metric ranging from 0 to 100 representing the authority of a website by analyzing its backlinks. This metric is crawled and computed by Moz and offered in both free and paid plans to marketers.